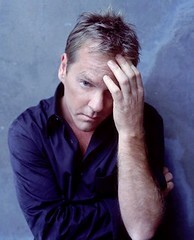 24's Kiefer Sutherland left the Glendale City Jail after serving 48 days for his latest DUI conviction. Sutherland -- the star of Fox television's drama, "24" -- has spent his sentence cleaning sheets, pillowcases and blankets on laundry duty, Balian told The Associated Press on Friday. "He was very humble, never complained," Balian said. "He didn't give us any problems at all." Kiefer Sutherland Gets 48 Days in Jail for D.U.I. A California judge today sentenced Kiefer Sutherland to 48 days in jail on his 4th D.U.I. arrest. It wasn't a surprise, since that's what his plea agreement called for. He asked to start serving the sentence immediately and will be at the Glendale City Jail. He must serve all 48 days in jail. Under the terms of his plea, he also must serve 60 months probation, pay a $510 fine, enroll in an 18-month alcohol-education class and attend weekly alcohol-therapy sessions for six months, [Asst. City Attorney]Jeffries said.